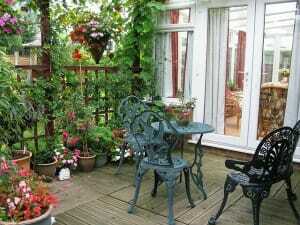 Looking for some inspirational ways to give your small space or garden a facelift? 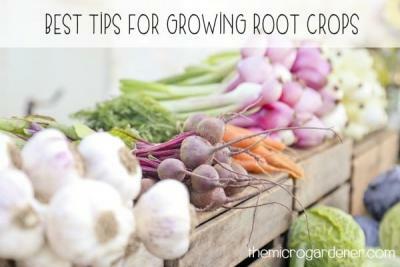 I’ve put together some thrifty and creative ideas to get the most out of growing a garden in pots. Hide them inside another container or cachepot. 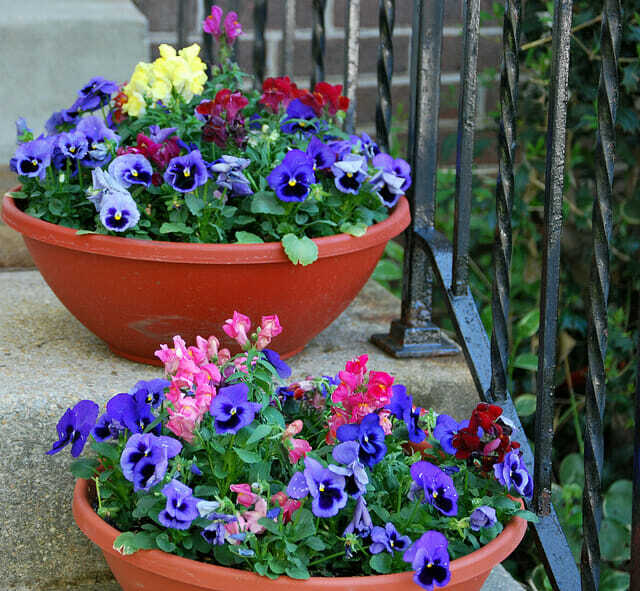 Try revamping old pots with a quick coat of paint for a colourful facelift. Pot within a Pot: If you want to use a ceramic, terracotta or brick pot for aesthetics, then to make re-potting easier, put your plant in a slightly smaller plastic pot inside the bigger one (pick one that fits the same shape). This becomes the cachepot. You can also hide an ugly pot inside a more attractive one! Position the top of the internal plastic pot just below the rim of the outer display cachepot by sitting it on pebbles, gravel or other drainage material. If you don’t want to see the inner pot, you can disguise it by covering the top of both pots with mulch (e.g. sphagnum moss, decorative pebbles, well washed sea shells or coir fibre). Internal Pot Space: When selecting a suitable container for a large plant, make sure you allow at least 8cm of internal space below the plant’s root ball inside the pot. This will allow sufficient room to add enough potting mix for the plant’s root ball to sit on and grow into. 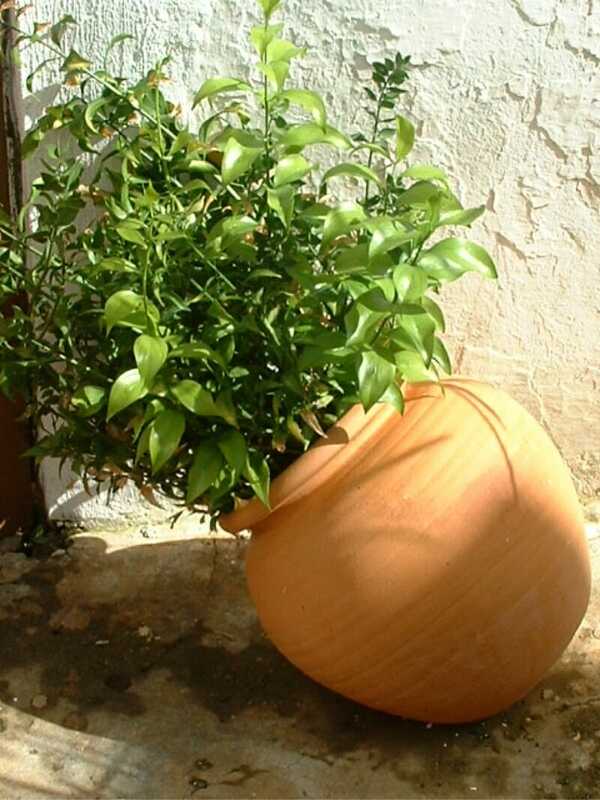 Heavyweights: Lightweight pots or tall bulky potted plants can sometimes fall over if exposed to winds. The best solution to this is to initially choose a pot with sufficient weight and to match it to a plant that won’t cause it to topple over by growing too tall. Keep your pot plants trimmed if you are in a windy location. Other solutions to avoid damage are to nestle the base of the pot in amongst some heavy stones or try to create a windbreak between the exposed area and the pot. 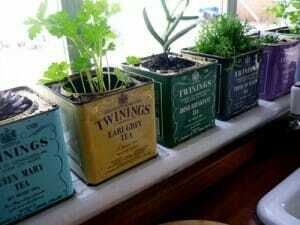 Grow a few plants in a heavy based tub as a living windbreak to screen other lightweight pots from being damaged. Alternatively, surround delicate plants or lightweight pots with other pots or containers to prevent them toppling over. Even if the lightweight pots do tip a little towards each other, the foliage is less likely to be badly damaged and these techniques also help insure your pots against breakage. Pot-ential: Garage sales, markets, fetes, produce supplies stores, friends and neighbours, council recycle centres and kerb clean up days, discount shops, the local paper and noticeboards are often good places to find containers and pots to start growing in. Repurposing old items into creative planters is easy, offers you loads of benefits and there are plenty of inspirational ideas and photos here to get you started. 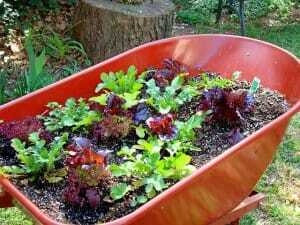 This rusty wheelbarrow was given a new coat of paint and now houses a salad garden. Windbreaks, Sun & Privacy screens: Delicate plants exposed to windy conditions on a high-rise balcony or verandah may need protection. Wind quickly dries out your pots, can knock them over, shred plant foliage and break their stems. In winter, wind chill will also affect plants. Enclose a balcony with a pull down shade screen, vertical trellis or plant a natural screen with a tub of taller plants that provide a hedge effect. Suitable species include compact dwarf varieties of lilly pillies and peppermint willow myrtle. Choose suitable plant species for the conditions: Not all plants do well in exposed conditions such as high wind, strong sun or extreme shade. Careful plant selection and positioning will avoid unnecessary casualties. Decorative urns: Often tall and on a pedestal, they are potentially top-heavy and vulnerable to falling over so select one that can counteract the weight in the base or secure it well. Safety in numbers: A smaller number of larger pots or planters rather than having many small pots means less chance of damage and lower maintenance. Creative containers: Provided there is adequate drainage and room to grow, you can re-use or repurpose an amazing array of containers and objects for growing food, colour or ornamentals. Spruce up an old wheelbarrow, or try growing new life in a pair of retired gardening boots, a child’s gumboots, watering cans, bathtubs, buckets, boxes and even a clamshell sandpit. 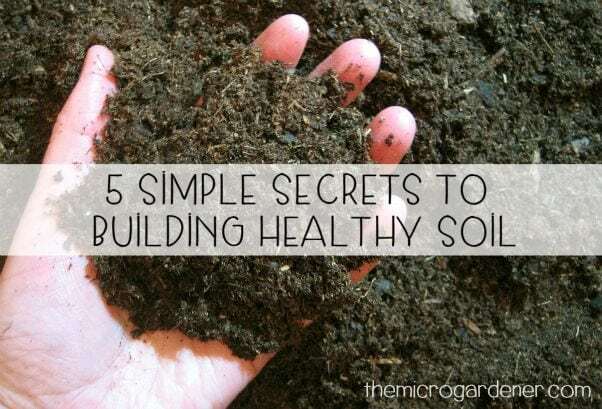 Bury it in the ground for a water garden or plant out a child’s garden. Green Gumboots! 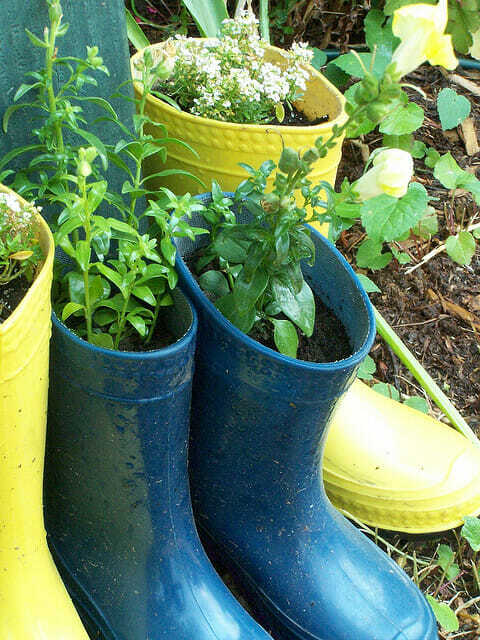 When little feet grow out of boots, why not reuse them as colourful containers for children to grow their own pick and pluck garden. Hanging in suspense: Hanging baskets make great use of vertical space and you can create eye-catching displays. 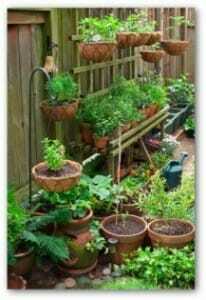 To save more space, buy a tiered set of hanging pots that are all connected one under the other. This will avoid wasting water and is great for privacy screens. Save with small pots: Avoid wasting money and space by planting shallow rooted vegetables, annuals and herbs into smaller pots rather than wasting them in deep ones. Save larger, more expensive pots for plants that need more personal space and have a deeper root system. Match plant to pot: Tall skinny plants can blow over in tall thin containers so match these up with a shorter heavier pot for more stability. 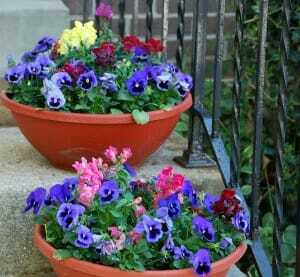 For dramatic visual effect, match your pot colour with the flowers or foliage you are growing in it. Using contrasting colours can have a striking effect especially when they are mass planted. If you liked this article, you might also enjoy Three Factors to Consider when Choosing Pots, The Benefits of Container Gardening and Choosing a Container – The Pros and Cons. Want to learn more? Don’t miss future posts – subscribe to my newsletter (and grab your free eBooks). Thanks for the great idea about painting old pots – I was going to toss my odd collection of pots as they are getting tired and stained. Now I can revamp them with a new look. I am wondering about using a metal bucket as a pot. It’s sturdy and quite attractive but has no holes. Any suggestions? Thanks for your feedback Amy! Metal buckets have loads of character and can be used as a feature in your garden. You can even buy paints that give metal an aged or rusted look! The down side is they provide little insulation and heat up rapidly which can cause root damage. If you are thinking of putting it in a hot sunny position, keep in mind the reflected heat can fry delicate moisture loving plants especially if you plant directly into the metal bucket. I suggest selecting hardy sun worshippers that don’t lose much moisture like hardy rosemary; lavender (pick one that suits your area); or lemon grass which is structural, delicious in herb teas and cooking or can be given a haircut and used for mulch. You don’t want to send your new plants to an early grave! If you are going to position the bucket out in the weather where it could potentially fill up with rainwater, you will need to drill some holes for drainage in the bottom first. Otherwise, your plants will drown! 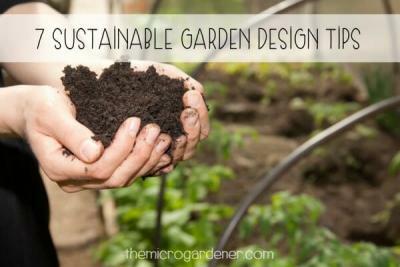 Sitting it up off grass will prevent it from rusting and allow free drainage too. There are plenty of low cost trolleys on castors available if you want to move it around. Alternatively, you could use the metal bucket as a cachepot (i.e. a decorative container holding another pot inside). This way, the plant roots are not in direct contact with the heat and you can use some form of insulation between the metal bucket and the inner pot if space allows. You can use lots of materials such as crushed terracotta from old pots, gravel, sand, polystyrene pieces (boxes are available from local green grocers usually for free or low cost and you save them from landfill!) or even bubble wrap. If you have to put the bucket in a hot position, then moisten the sand or gravel down the inner sides and this will help keep the plant cool. If you want to keep your bucket in a more sheltered undercover position such as on a deck or balcony, where you will be watering by hand, it won’t be necessary to drill holes. Instead, fill the bottom of the bucket with sand or gravel (about 5cm) then sit the pot plant inside on top of this. Excess water will then drain into the bottom of the bucket. This prevents root rot or the water getting stagnant and inviting unwelcome visitors like mosquitoes to come and set up house at your place! 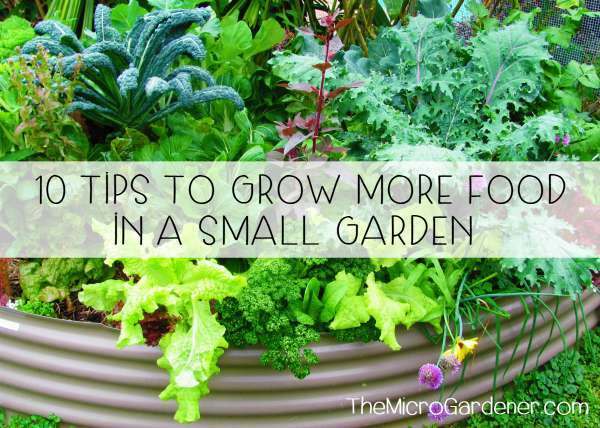 Position the plant soil about 3-5cm below the rim of the bucket to allow for mulch. Once you have positioned the plant inside the bucket and added the insulation, top with a light layer of mulch. 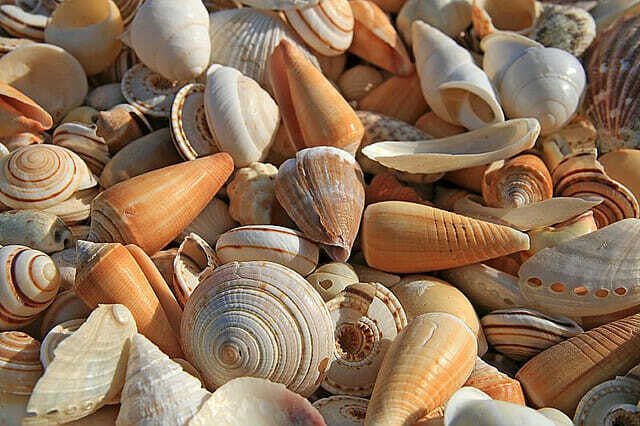 As I live in a warm sub-tropical climate, I like to add mulch that will feed the plant (such as sugarcane, lucerne, compost or lemongrass) and then add a light coloured decorative mulch such as pebbles, gravel or (well-washed) seashells on top of that to hide the inner pot and make it look beautiful. Finally, think about what you want to grow. Look at the height of the bucket and plant for balance, function and aesthetics. Consider the structure and texture of the plants too. Tall upright plants won’t touch the sides of a hot metal bucket but trailing leaves and flowers that look beautiful might only be appropriate for a position where they are not in direct hot sun all day. Last thing you want to do is give them sunburn! For an edible garden, try selecting a tall feature plant to go in the centre such as shallots or leeks. Their tall blue/green foliage will look great against the metal backdrop. 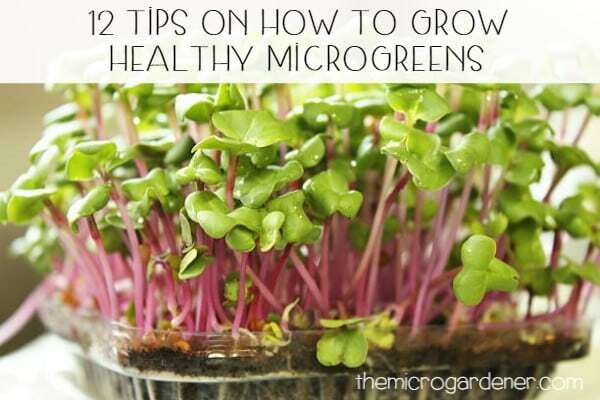 You could soften around the edges with herbs that will have a more sprawling habit like oregano, lemon thyme, common thyme or sage and curly leafed parsley. Then when you brush past, you’ll enjoy the fragrance as much as the flavours. Remember to mulch them to retain moisture. Thanks for stopping by and hope this helps. Good luck with your project!